First day back at work after getting back from stewarding at Spring Harvest, and I really didn’t feel like doing any work at all! It was a really tiring week over in Skegness – we were having to get up at 6am and finished at about 1am, with only half an hour break in the day to get lunch! It was a really good group of guys there this year, and I’m going to try and keep in touch with some of them… although I am the worst for keeping up-to-date with emails and stuff! I got back to Manchester on Tuesday night, and was in bed by eight o’clock… the earliest for a very long time! And I didn’t get up until Wednesday lunchtime! I think I’ve just about got over the lack of sleep now. I’ve just arranged to get a broadband connection fitted next month (although it’s got to wait until I’ve got the living room sorted) so it should be easier updating my websites and all that. I’ve got to update the Skeggy Stewards site soon with all the photos from this year’s event – I’ve just taken my photos in for developing so will probably scan them at the weekend. Walking up Snowdon, plus a new nationality! I am aching all over! 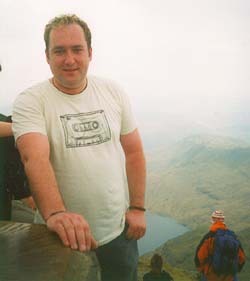 But that’s probably got something to do with the fact that I walked all the way up to the top of Mount Snowdon yesterday! A load of us went over to Wales yesterday morning to go for a walk in Snowdonia for Dave Cieszynski’s birthday, and I don’t really think it had registered with me that Snowdon is in fact the tallest mountain in Wales! So we ended up walking about 10 miles in all, and 1085 metres up! It was quite a killer, ‘cos there are parts of it which are really quite steep, and it’s very rocky, so your feet can end up sliding all over the place! For the first hour going up, I didn’t find it too hard really, but as time went on, it got more difficult. It took us about 3 hours to get to the summit, and the view from up there was stunning, but it was also pretty cold on the top! It was a bit quicker coming down – that only took about an hour and a half – but my feet were beginning to feel the strain by that time. And when I finally got up this morning, it took a little bit longer than usual to walk down the stairs – very painful!… and I’m at work at the moment, and it’s quite a struggle walking from one end of the office to the other! Check out the photos here. On the way back, we stopped off in Llandudno and had some tea at Emma’s mum’s house. When I was lodging at Emma’s last summer, her mum and her dogs and cats were staying at the house whilst she was waiting to buy this one, so I got to meet all the animals again! Everyone was pretty worn out, and just crashed out in the living room, and I was so glad that I hadn’t driven there – it’s much better being a passenger after a day like that!